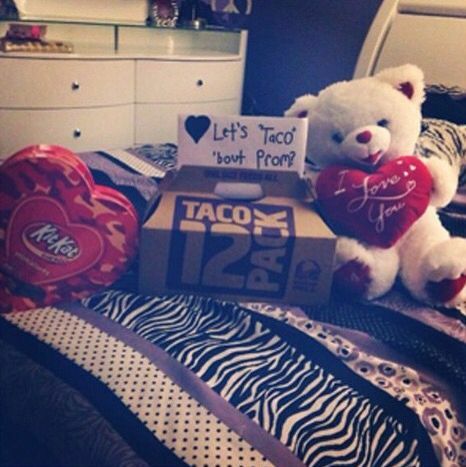 What is a promposal you ask? 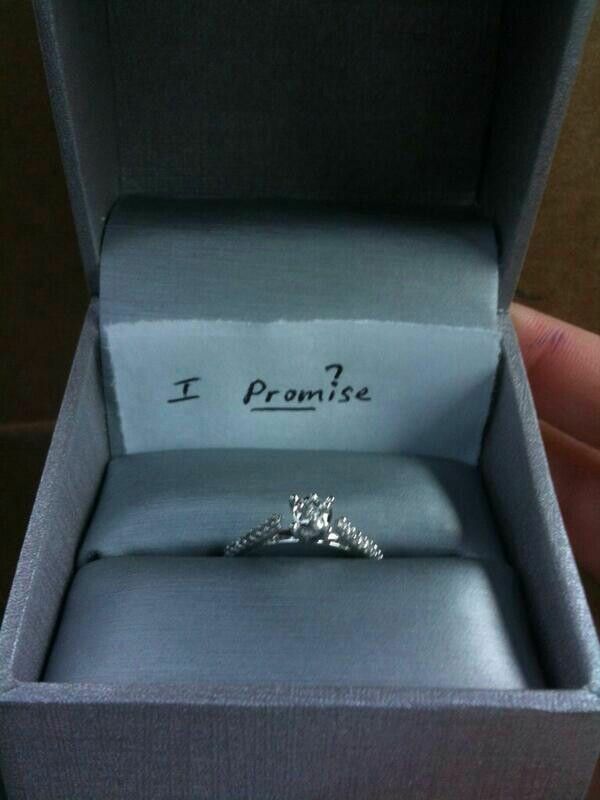 A promposal is by definition an elaborate and public proposal to take somebody to a high school prom. Every year the boys get more creative, some will tug at your heart strings and others will have you laughing. 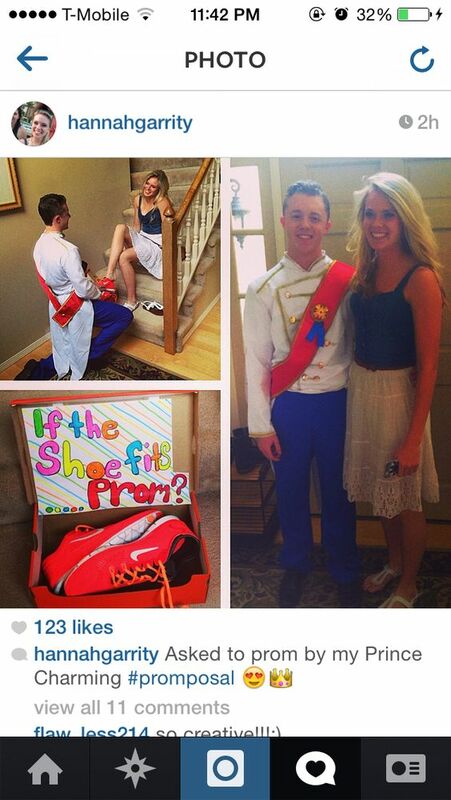 Either way it is just amazing that they are thinking outside the box in stead of the typical "Will you go to prom? ", they are giving us elaborate performances! 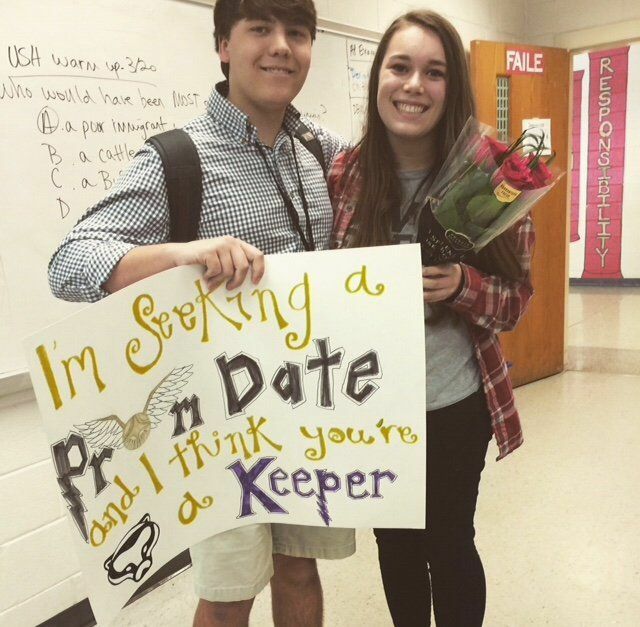 Whats even better is that there are even a few celebrity promposals as well. Make sure you sign up for out newsletter, maybe your promposal will make Roo's News too! Elna is 17 years old, and is a high school senior in Elyria, Ohio. She is nonverbal and uses a wheelchair because she has a rare progressive disorder. Her boyfriend, Cody Wilson, died last fall, and didn't have a date for prom. Her parents, Ebony and Ingrid Wright, took to social media to see if an athlete of the Cleveland Browns might take her to prom, as Elna is a big cleveland sports fan. Cleveland Browns center Cameron Erving stepped up to tackle prom with Elna, and it couldn't have been sweeter! Watch the video below to learn more about Elna's special night. This entry was posted in Celebrities, Promposals and tagged celebrities, Prom, hot celeb guys, hottest celebrities, In The News, celebrity promposal, news on May 16, 2016 by Chrissy Roos. It's Prom Season, and promposals are in full swing (along with finding your perfect prom dress, of course)! There are so many cute ideas that we've seen floating across the internet, and the most recent one comes from a high school that's not too far from our store in New Jersey, Oakcrest High School. 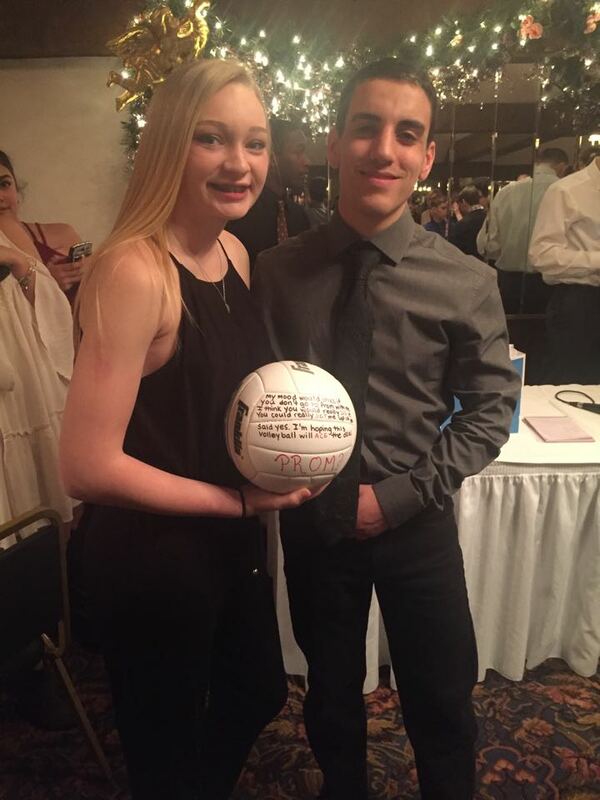 Dana Cameron-Bucci recently shared with us the photos of a cute volleyball themed promposal between two Oakcrest students, Charlize Synder and Sean Stabile. 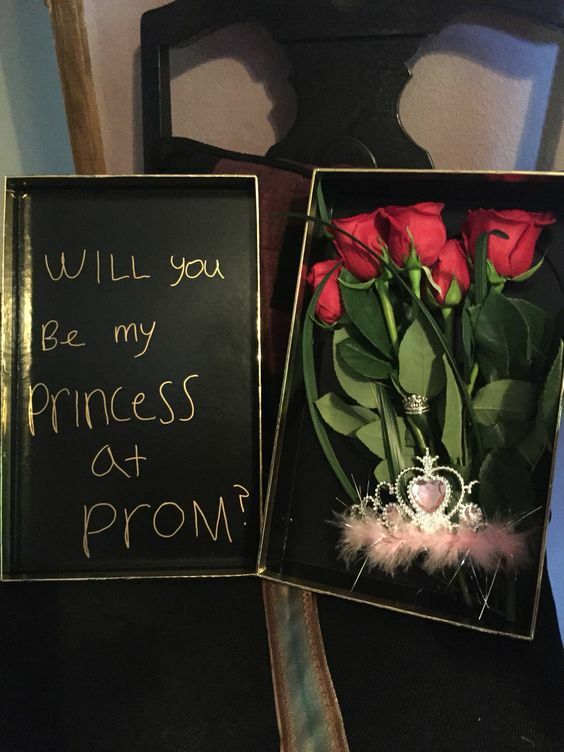 This entry was posted in Promposals and tagged Prom, promposal ideas, promposals, prom fun, promposal, prom ideas, Prom 2016 on March 21, 2016 by Chrissy Roos. 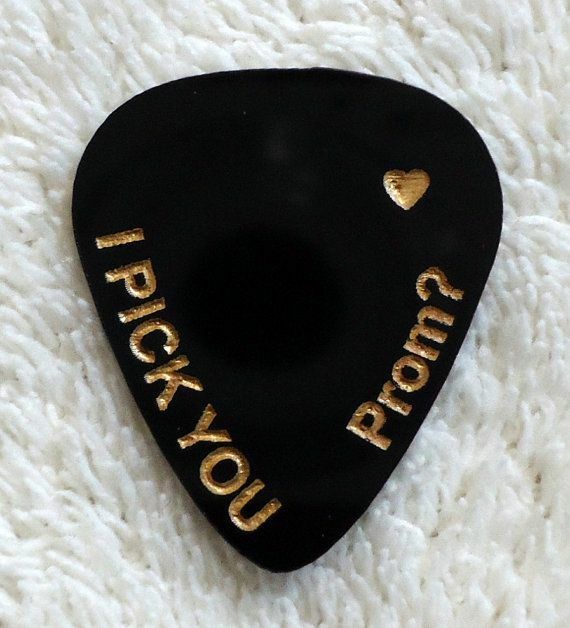 Lots of planning goes into promposals these days, and you can only hope for the best when it's time to pop the question. 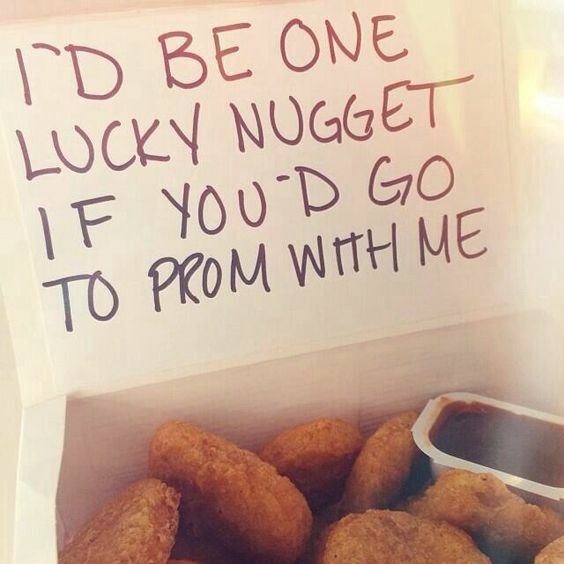 Most promposals go down without a hitch, as many times it's a boyfriend or girlfriend asking their significant other in a cute way to prom. But, there are cases where the proposer doesn't know if the proposee will actually be accepting, and this is one example of that. This high schooler went for a daring prom proposal - asking the girl he hoped to go to prom with in front of an entire football stadium full of people. 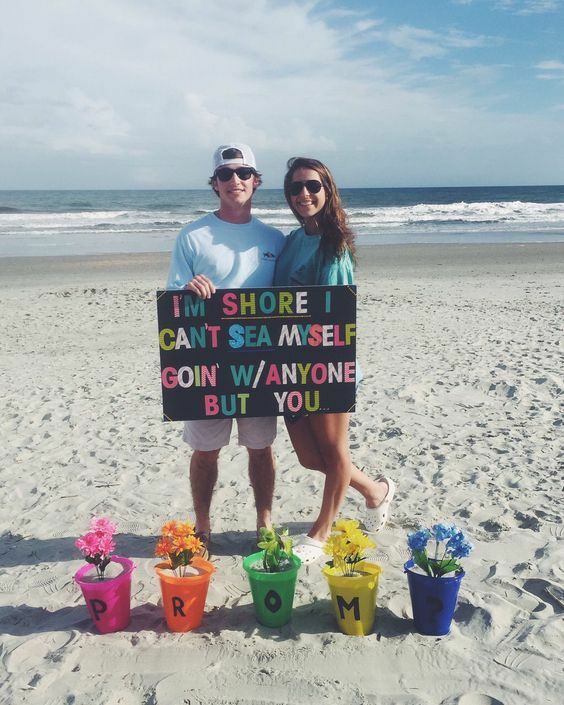 He must have thought this promposal was in the bag, but that it was not! After the high schooler asks his hopeful date over the microphone if she'll go to prom with him, he was let down anything but gently as the girl responds in the microphone, "I already have a date." Awww! You can tell the high schooler is shocked by his response, and we can't blame him. How the word didn't get around that the girl already got a date is beyond me! That's what friends are supposed to be for, after all! 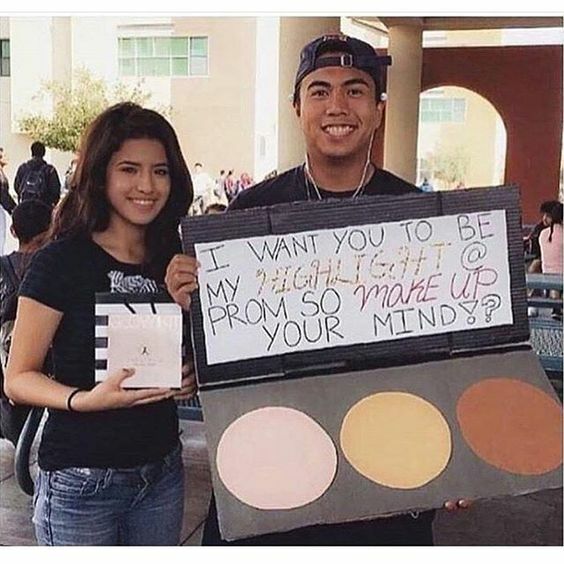 Oh well, it might be a promposal gone wrong, but it's certainly something he'll look back on in a few years and get a good laugh out of, if he's not already. 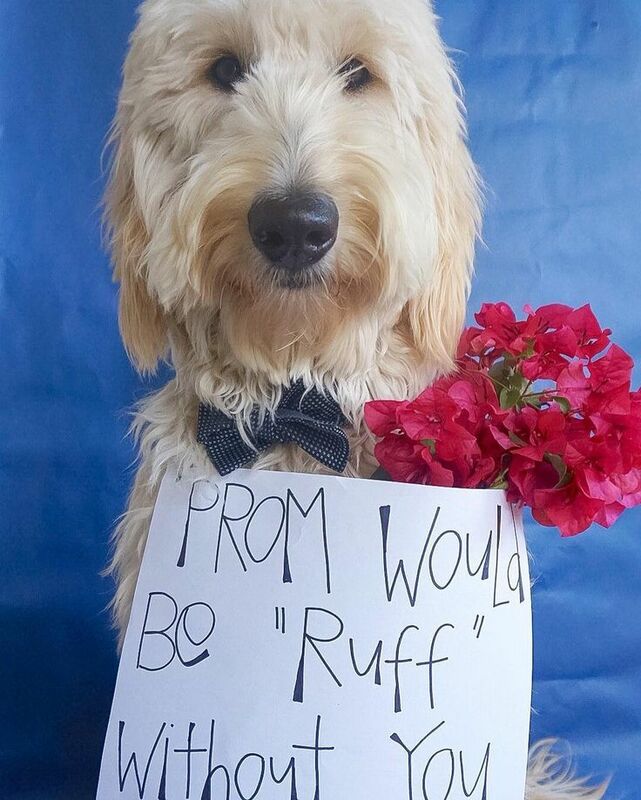 Sadly, this isn't the only promposal fail we stumbled upon this year. For another cringing moment, check out Daniel's promposal fail... to his own girlfriend, of all people! 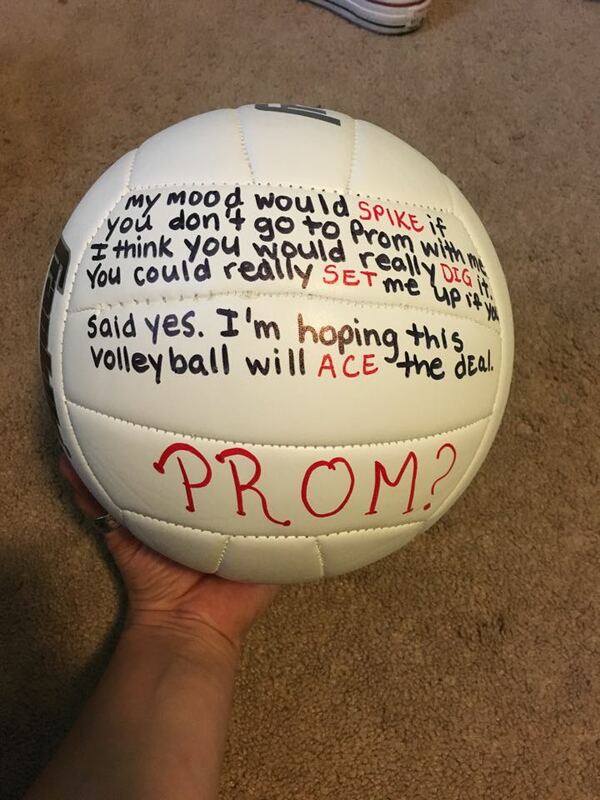 This entry was posted in For Fun, Promposals, In The News and tagged Video, Prom, In The News, promposal ideas, promposals, promposal, Prom 2015 on June 4, 2015 by Chrissy Roos. 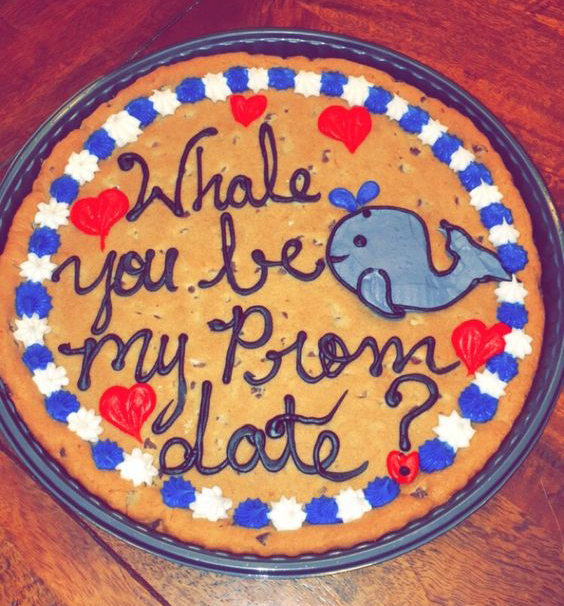 A Promposal Cake to Drool Over! 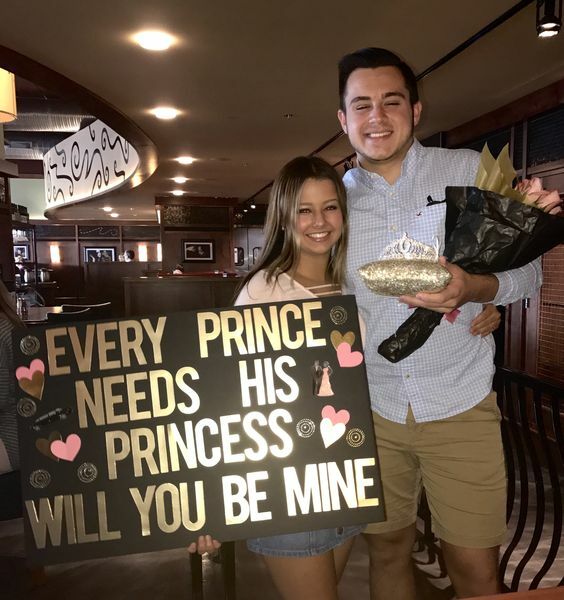 This year's promposals have been epic, and we know we're going to be super disappointed when Prom 2015 is over and the promposal and prom pictures become a distant memory. But, for now, there are still many amazing prom pictures and stories to share with you! The latest comes from one of our Roo Girls, Brianni (@briannimartinez on Instagram), who bought a La Femme dress from us earlier this year. See her special promposal below, as well as the prom dress she chose! 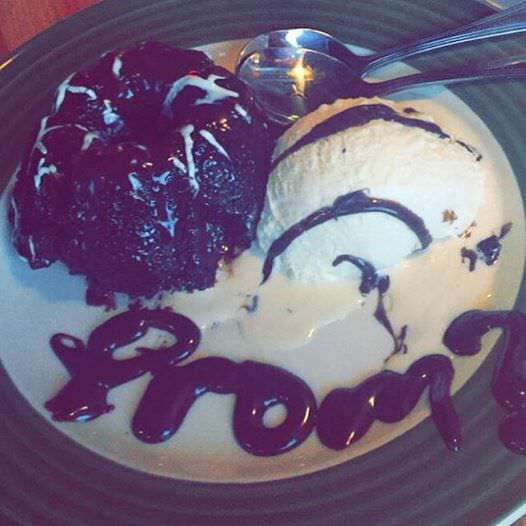 Brianni's promposal surprise was a delicious chocolate cake, that spelled our "Prom?" in chocolate syrup. Drooling yet?? 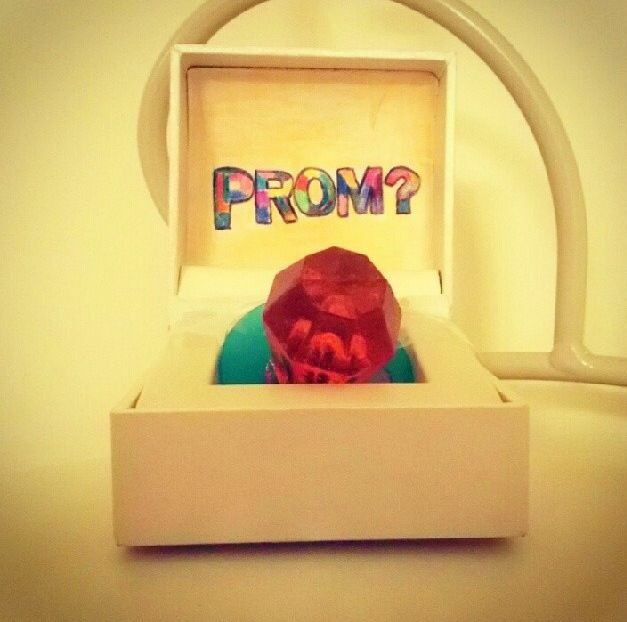 Brianni wrote in the comments of the picture, "So here's my late, but cute, cheesy, but delicious promposal from my best friend #instagramlessluis #prom." 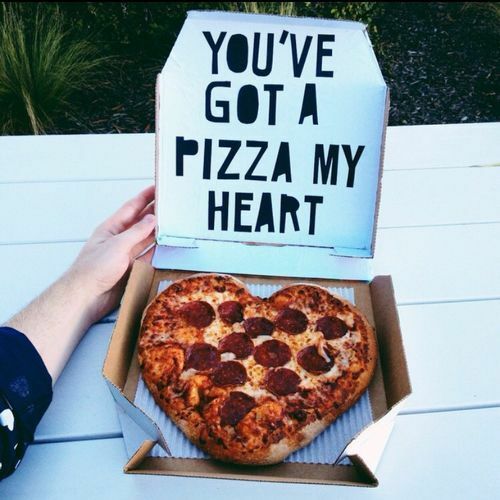 All we can say is SUPER cute... and SO not cheesy (it's chocolately, duh!). 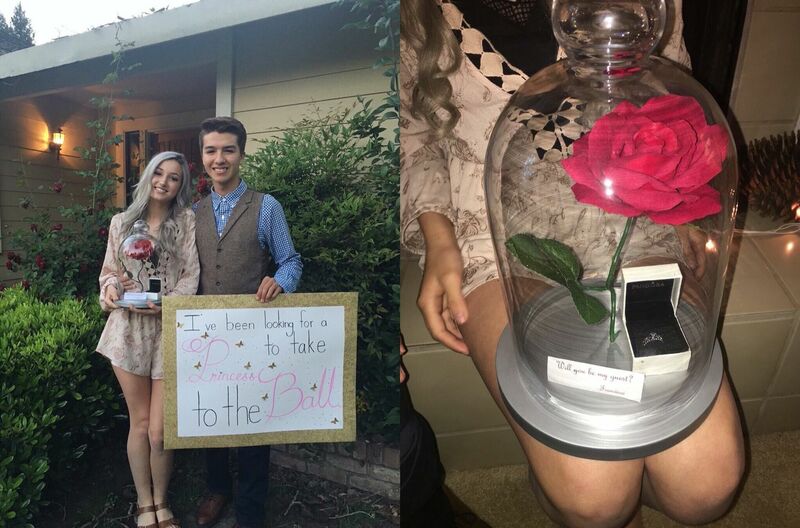 But, before the promposal cake came, she already picked out her dress! 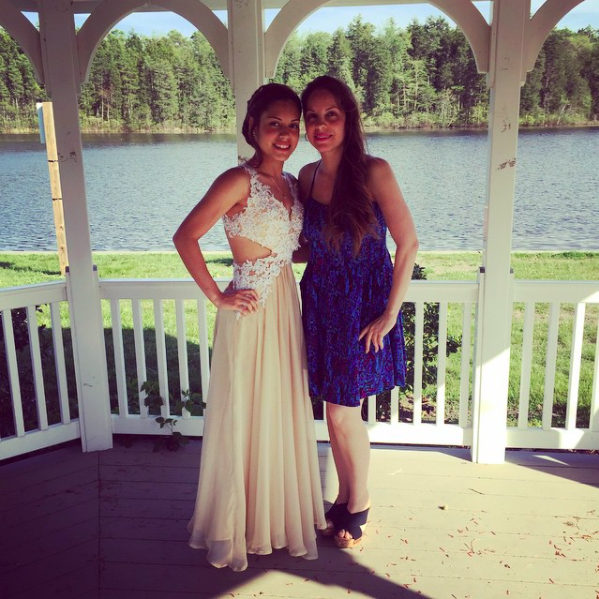 She came and visited our Rissy Roo's store in Linwood, NJ and found the perfect dress for her prom. In her Instagram post, she said, "Guess who got their prom dress today??? #prom2k15 #imslightlyready"
She commented on Instagram, "Senior year prom with my momma #prom2k15 #roogirl"
We're so glad that Brianni had a special senior year prom experience that she will always remember... from promposal to prom night! 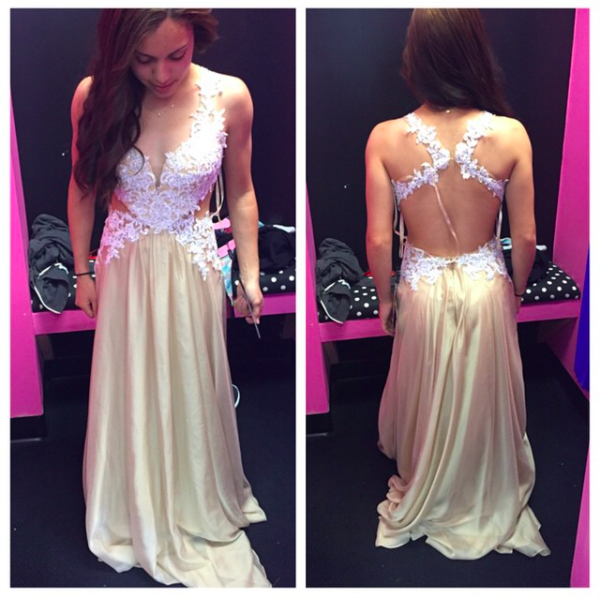 This entry was posted in Promposals, Prom Dresses and tagged Prom Dresses, La Femme, Prom, Prom dress, promposal ideas, promposals, promposal, Prom 2015 on May 11, 2015 by Chrissy Roos. Prom can not only be a fun time to dress up and have a special night out with friends, but it can also be a time for very special things to happen. Recently one of those very special moments happened at a high school in Kentucky. 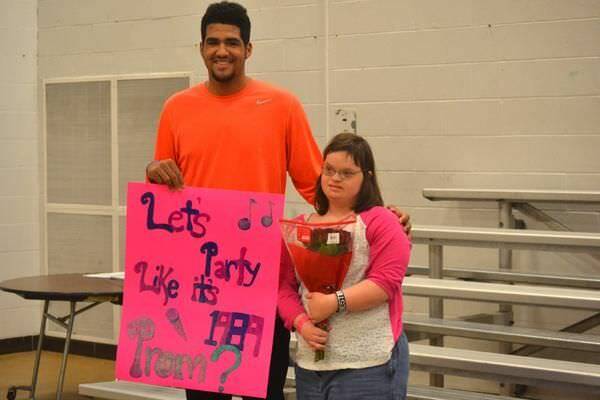 A basketball star at Eastern High School in Louisville, Kentucky, Trey Moses, asked a girl with Down Syndrome, Ellie Meredith, to be his prom date in the sweetest way possible. He proposed to her with a bouquet of flowers and a sign that referenced Taylor Swift, the girl's favorite singer. 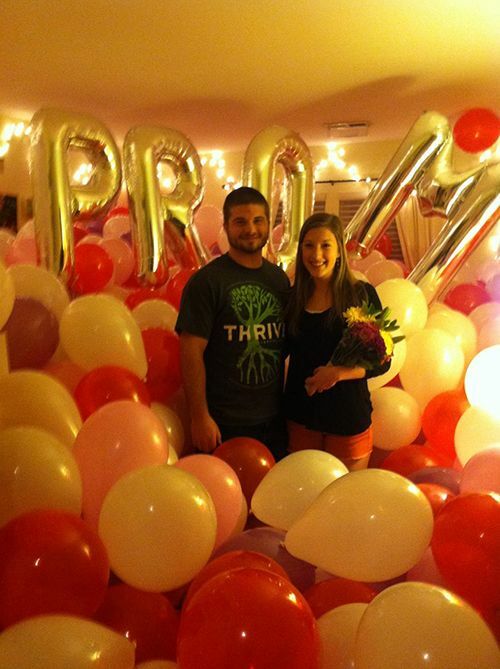 Trey was originally going to ask his girlfriend to go to prom with him, but decided to ask Ellie instead. He texted Ellie's parents the night before to get their permission, and they were happy to say "OK!" So, the next day, he showed up to Ellie's PE class with a sign saying, "Let's Party Like It's 1989." And, party they will do because Ellie said YES to the promposal! This all happened in part due to a special program that Trey volunteers for, called Best Buddies. CNN, who wrote about the story, explained that "Best Buddies cultivates friendships between students with and without developmental disabilities and prevents students like Ellie from feeling isolated and left out of social functions. Trey also explained that he wanted to take Ellie to prom because, "She's great...she listens and she's easy to talk to." Ellie is so excited for prom and can't stop thinking about it, saying, "I've only told about a million people!" Her mom explained, "Ellie can't wait to go dress shopping." We hope Trey and Ellie have an amazing time together at prom! 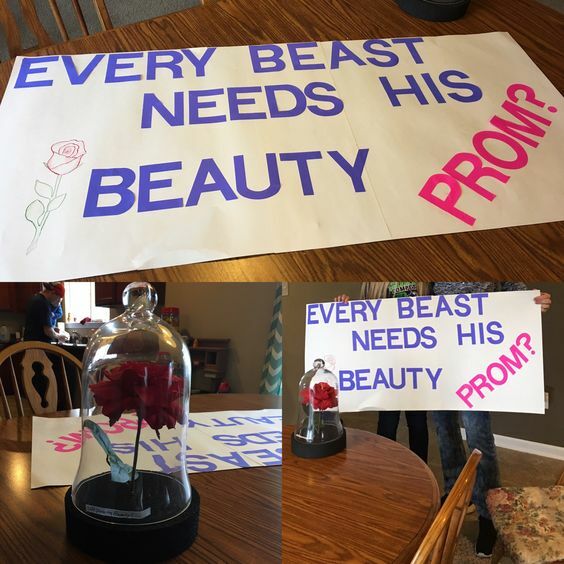 This entry was posted in Promposals, In The News and tagged High School, In The News, High School Prom, promposal ideas, promposals, promposal on April 17, 2015 by Chrissy Roos.